Halloween 2014 Costume Contest Winners! | Take Back Halloween! 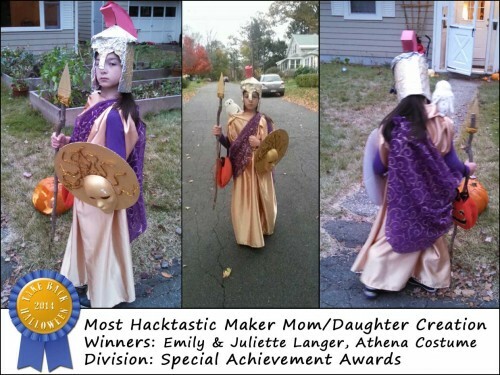 Halloween 2014 Costume Contest Winners! They’re here! 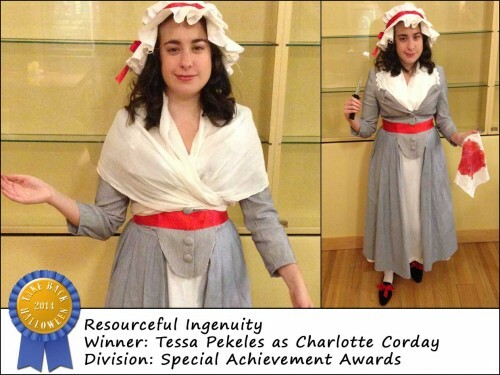 After much agonized sifting through the many amazing entries, we have finally settled on the winners of this year’s costume contest. If you need a refresher on the rules and what the whole deal here is, check out our original contest announcement post. The level of quality in the entries was incredible this year, and the judging was painful. There were many, many very close decisions. Thank you, all of you, for participating and sending us your wonderful photos and stories. And if you didn’t win this year, there’s always next year! Now that I’ve done this a couple of years in a row, I realize why so many Halloween contests just announce the rules and the overall prize purse up front and leave the specific awards TBD until they’ve seen all the entries. You really do have to tailor it to the type of submissions you get. Maybe we’ll do that next year. As it is, we’ve enlarged our prize purse this year to give out more awards than we’d originally announced—wahoo!—and we’ve tweaked the names a bit to better reflect the achievements. 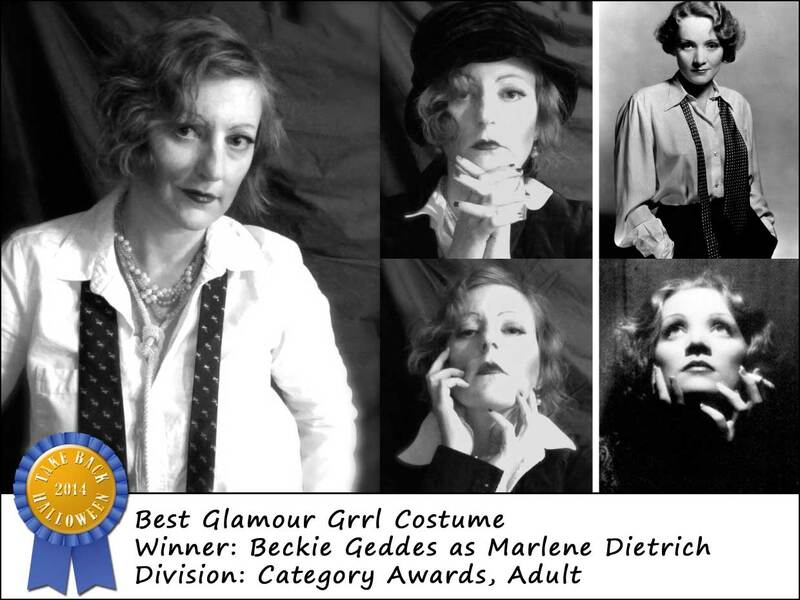 These are only for costumes that appear or might appear on our website in one of our standard categories: Notable Women, Mythological Figures (goddesses and legends), Queens, and Glamour Grrls. All winners will receive a $25 Amazon gift certificate. 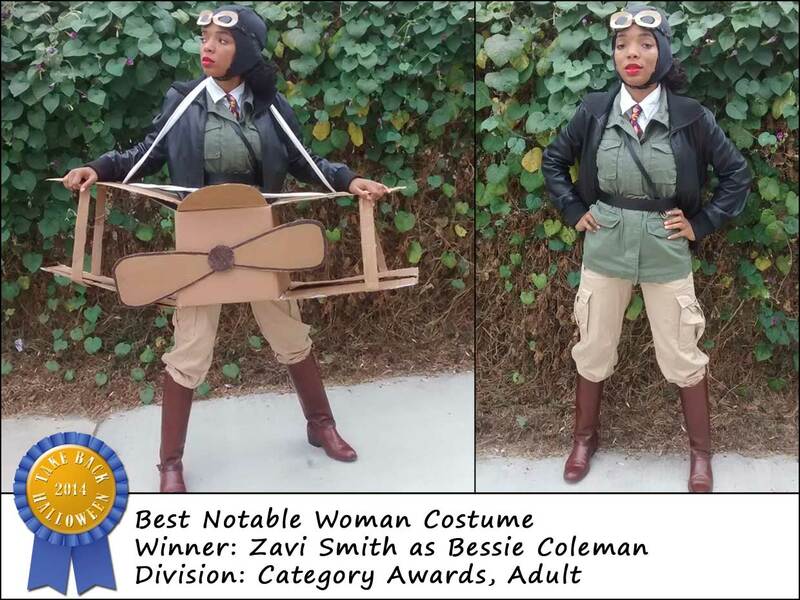 Winner: Zavi Smith as Bessie Coleman. 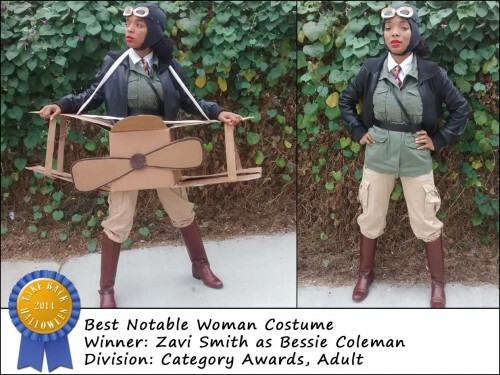 The only thing better than a Bessie Coleman costume is a Bessie Coleman costume that actually includes the plane. The mystery here is how Zavi was able to get through the photo shoot without cracking up. Huge kudos for everything: the outfit, the plane, Zavi’s game face, the photo shoot, everything. LOVE. Winners: Nina Ghaffari and Jeff Rudis as Akna and Bahlam. 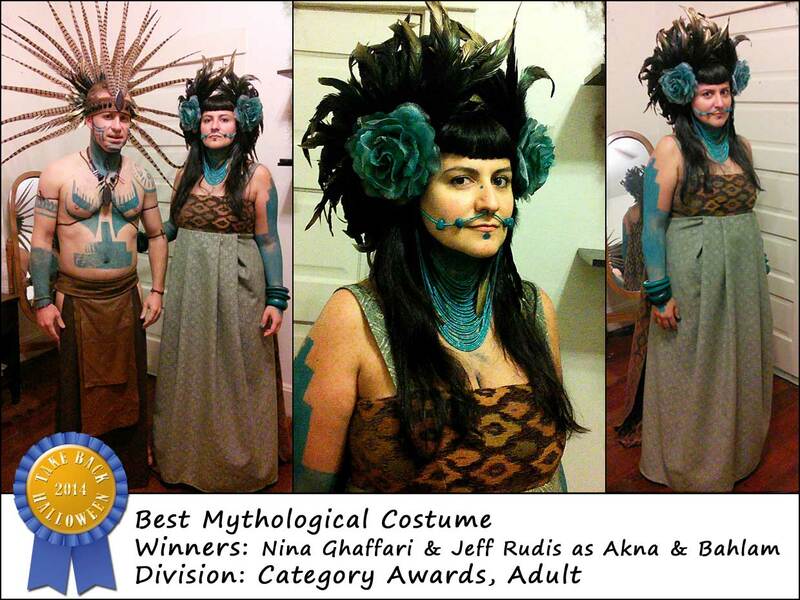 These phenomenal costumes are Nina’s original designs, and they’re utterly brilliant. Akna and Bahlam are Maya gods (she’s a fertility goddess, he’s a jaguar god), and Nina created these outfits using upholstery fabric, pieces of old luggage, feathers, paint, beads, and a heaping portion of pure design genius. Seriously amazing. Winner: Janice Strickland as Queen Puabi. Anyone with eyes can see that Janice is the very embodiment of a magnificent Bronze Age queen. But it’s possible that you need to be either an archaeology buff or a hard-core Take Back Halloween aficionado to appreciate just how perfect this costume really is. 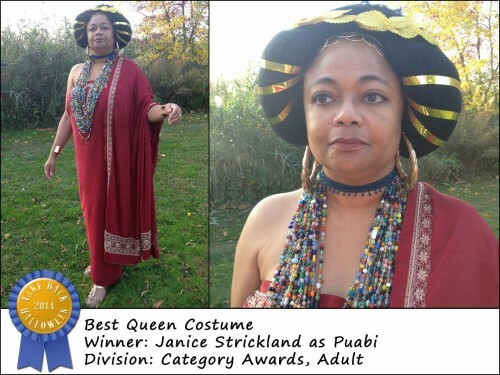 Suffice it to say that we no longer need to have our Puabi costume photographed on a model; we can just refer people to Janice’s pictures. Janice, you’ve made our dreams come true. Same rules as for the Adult division: only costumes that fall into one of our standard categories. All winners will receive a $25 Amazon gift certificate. 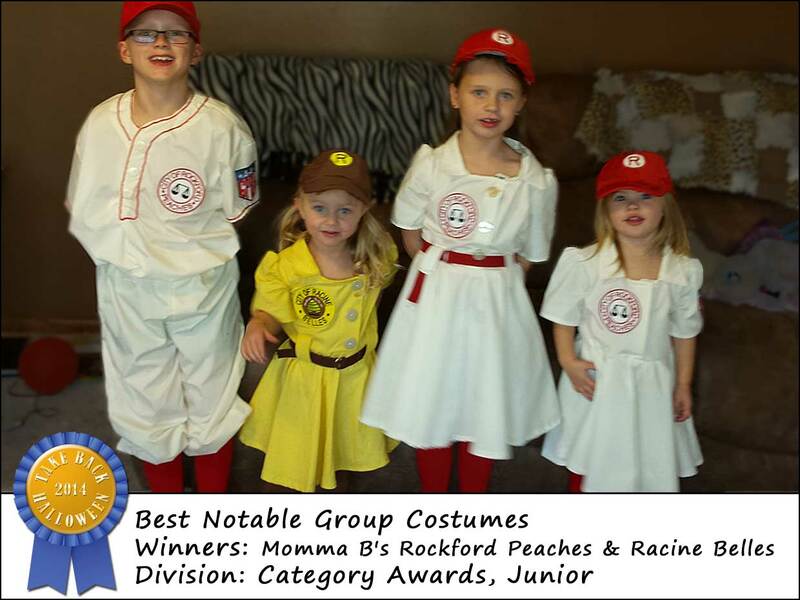 Winners: Momma B’s Rockford Peaches and Racine Belles. So what do you do if it’s Halloween and you have a sewing machine and access to several children? Obviously you turn them into baseball players (and one manager) from the All-American Girls Professional Baseball League. Nice job! 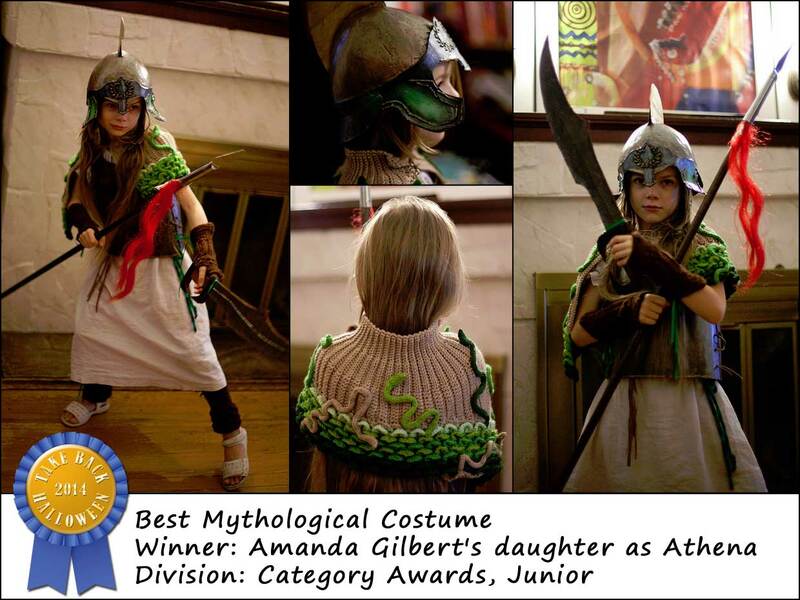 Winner: Amanda Gilbert’s daughter as Athena. This little costume is quite the work of art: its creation is documented in detail on the DIY Del Ray blog. Amanda crafted every bit of this, including the gorgeous crocheted aegis. We are in awe. 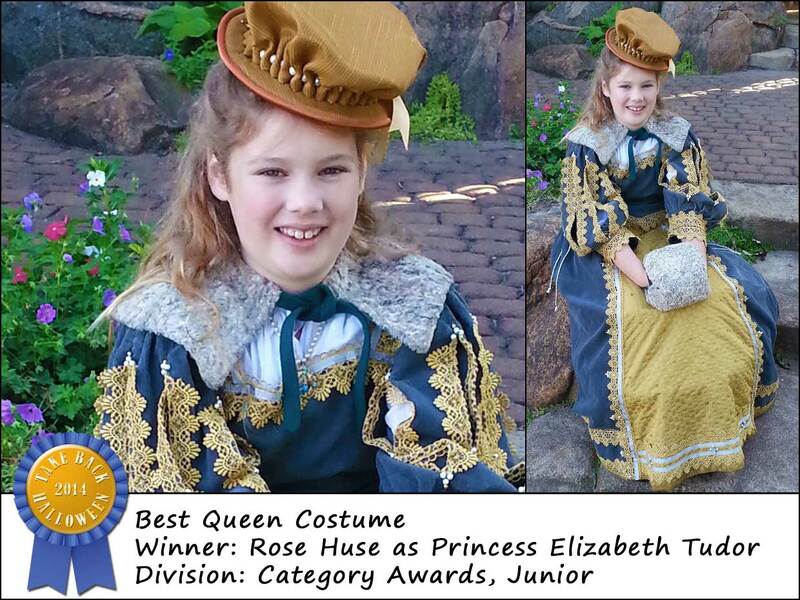 Winner: Rose Huse as Princess Elizabeth Tudor. If I’d had a costume like this when I was Rose’s age, I never would have taken it off. I would probably still be wearing it, in fact. Congratulations, Rose! And props to your wonderful mom Karen. This division is so we can call out particular accomplishments, like superior artistry or homemade craft-fu or impressive design execution. We’ve also added (since our original announcement) an award for “inspired performance,” to recognize entrants who did an amazing job of inhabiting their characters. All winners will receive a $25 Amazon gift certificate. Winner: Angelica Reyes as Nefertiti. 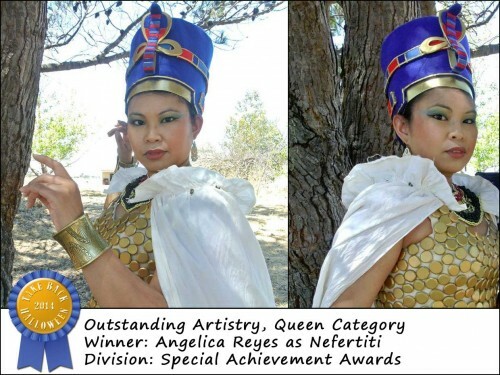 We told Angelica that we have a terrible case of Blue Crown Envy after seeing her costume. She says she made the crown with cardboard and felt; the gold band was trim from JoAnn’s. Isn’t it gorgeous? 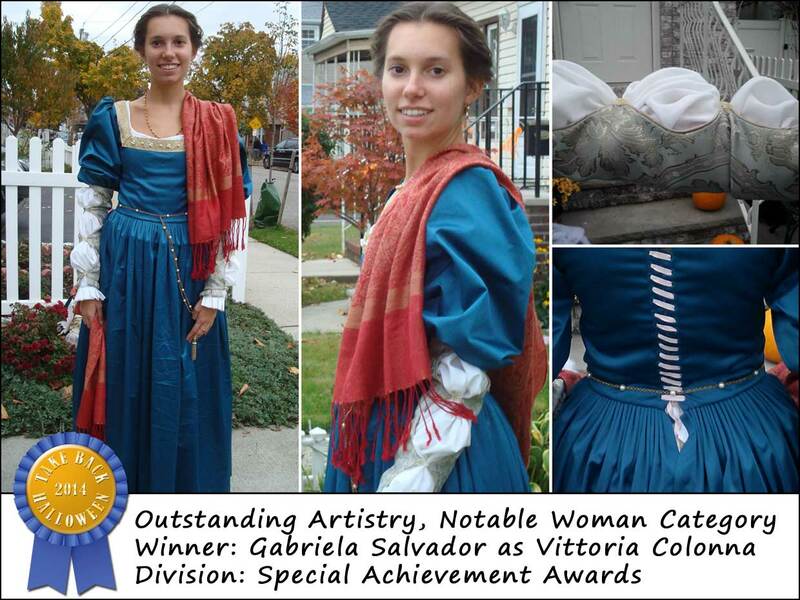 Winner: Gabriela Salvador as Vittoria Colonna. Gabriela describes herself as a “self-taught seamstress with an interest in historical costuming.” Her work on this mid-16th century Florentine gown is absolutely exquisite. WE WANT THOSE SLEEVES. 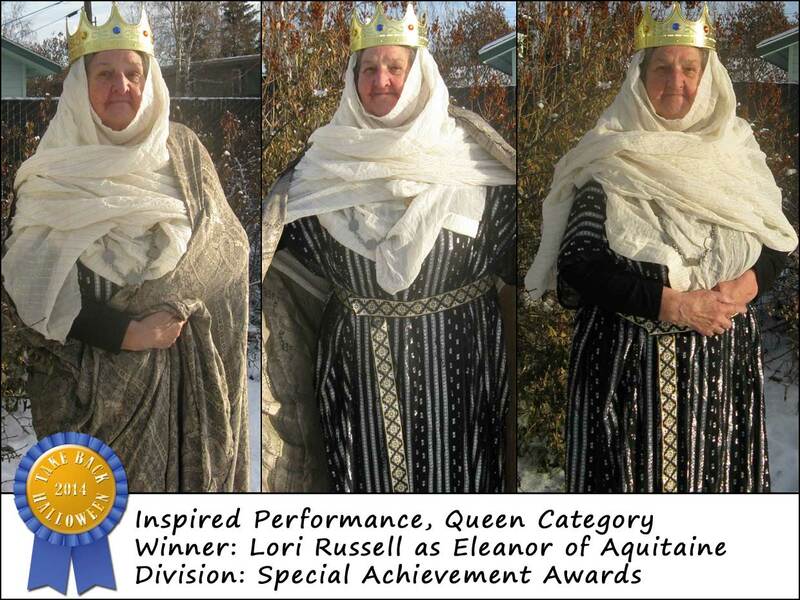 Winner: Lori Russell as Eleanor of Aquitaine. If the real Eleanor of Aquitaine had lived in a suburban neighborhood in Alaska, she would have looked just like this. Hanging out in the backyard, wearing her crown and her silver-shot dress, looking all regal and imperious. Full props to Lori’s daughter Robyn, who pulled together the costume pieces and did the styling. 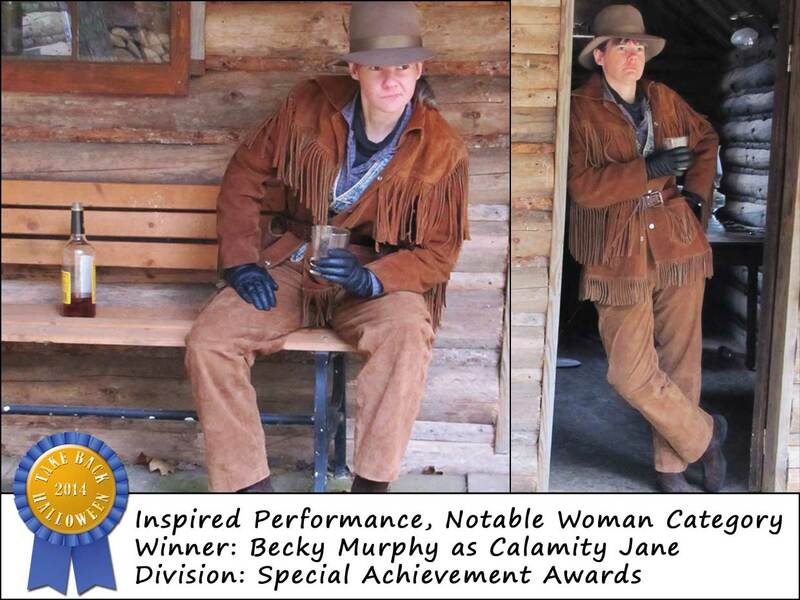 Winner: Becky Murphy as Calamity Jane. If they ever do a sequel to Deadwood, let’s hope the casting director sees these pictures. Ladies and gentlemen, introducing Becky Murphy! (My mother looked at these pictures and said, “My goodness! Is she…drinking?”) Good job, Becky. Winner: Tessa Pekeles as Charlotte Corday. Make sure you click to embiggen so you can see what Tessa did here. She cut up a thrift-store blazer to fake the look of an 18th century bodice, which happens to be one of our favorite costume hacking techniques. We’re also in love with Tessa’s shoes. WE WANT THOSE SHOES. 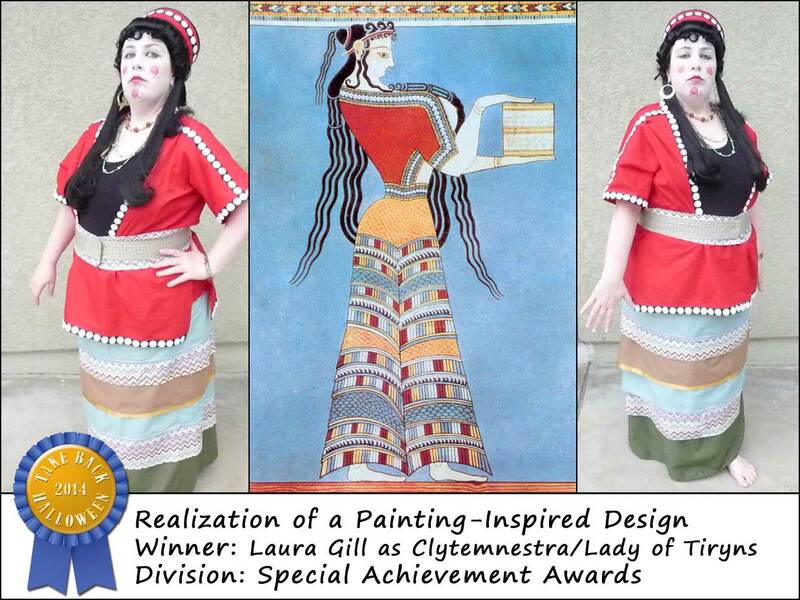 Winner: Laura Gill as Clytemnestra (based on the Lady of Tiryns). The inspiration for Laura’s Clytemnestra costume is the Lady of Tiryns, a fresco from a 13th century BCE Mycenaean palace. The crafting that went into this costume is incredible, because Laura made the dotted border by cutting out and gluing a billion little felt circles onto black grosgrain ribbon. And she’s still sane! Winner: Tyler Whitaker as Christina of Sweden. 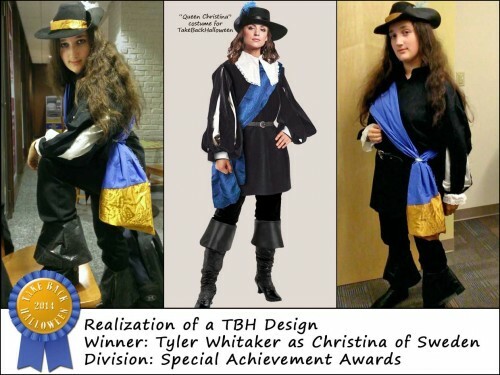 Here’s Tyler, and here’s our Queen Christina costume. Good job? You’re darn right that’s a good job. Though strangely, Tyler elected not to wear a large crocheted napkin at her neck. We can’t imagine why. 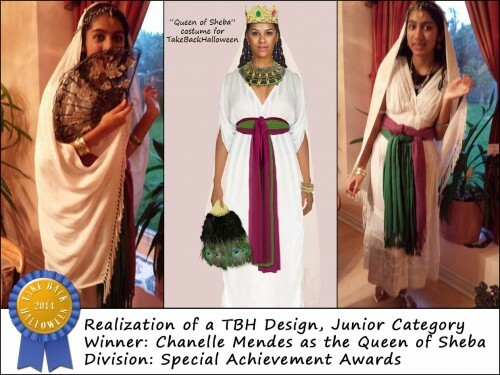 Winner: Chanelle Mendes as the Queen of Sheba. Chanelle is only 14 years old and is obviously a very smart young lady. She tells us that she is fascinated by the queens of antiquity, and used our costume ideas to put together a Queen of Sheba outfit. She also arranged this very atmospheric photo shoot. Wonderful job, Chanelle! Winners: Emily and Juliette Langer, Athena costume. We adore hacktastic costumes, and this one is heart-meltingly delightful. Emily and her daughter Juliette worked on this costume together, and were obviously very resourceful with their crafting. The shield looks like a pizza circle or cake circle, with a craft store mask and glittery pipe cleaners glued on. But what really puts it over the top is Juliette’s performance. She’s just killing it as Athena. So serious. This division is for costumes that fall outside our regular categories: copyrighted and fictional characters, animals, things we didn’t expect, whatever. But we’ve enlarged our prize purse so that all the winners in this division get a $25 Amazon gift certificate like the other winners, so it’s all good. 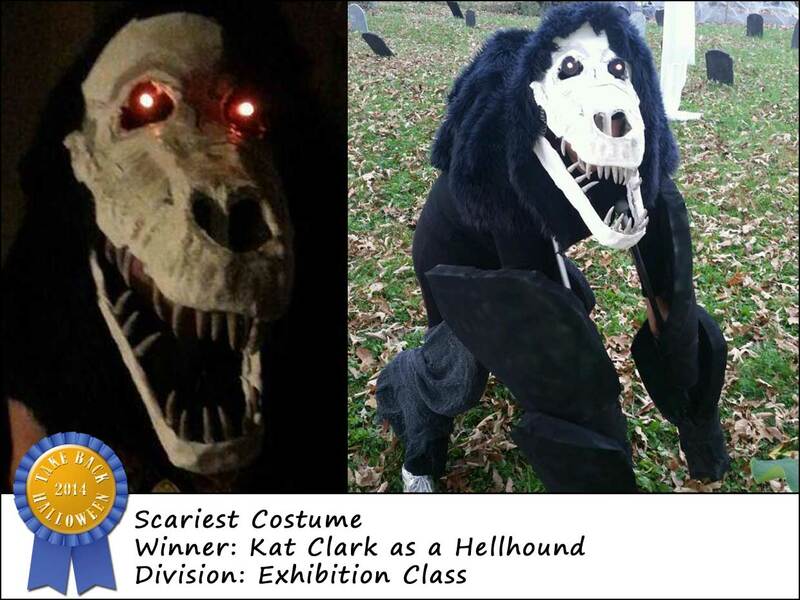 Winner: Kat Clark as a Hellhound. Best comment on this costume from our Facebook page: “Holy CRAP that is terrifying!” Yeah. Kat says the burning eyes are tealights, and the head assembly is constructed out of coathangers, wire mesh, plaster wraps, duct tape, and hot glue. 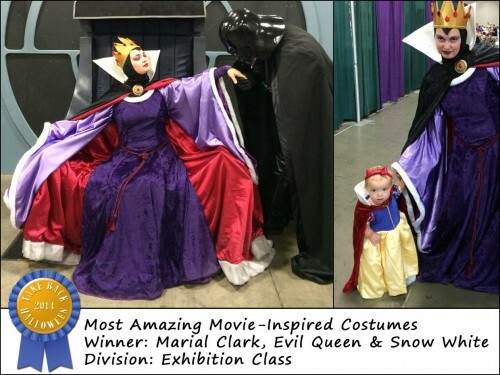 Winner: Marial Clark, Evil Queen and Snow White costumes. 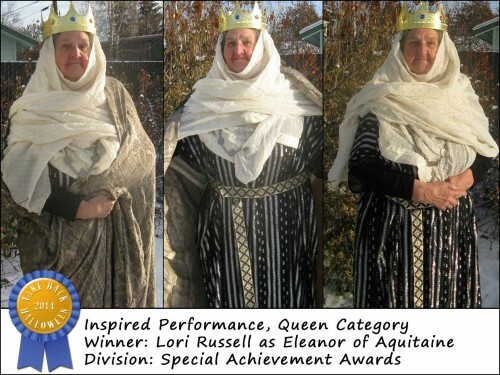 Marial is the Evil Queen (heh), and she made these marvelous costumes by hand for herself and her daughter, Snow White. Darth Vader not included. Winner: Olive Johnson, Stormfly costume. 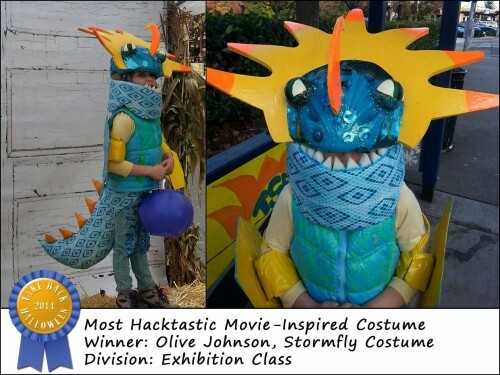 Olive made this incredible Stormfly costume for her 5-year-old daughter, and she says it was a month-long project. We have no idea how that whole thing is working there (what is that foam? ), but we can believe it took a month. 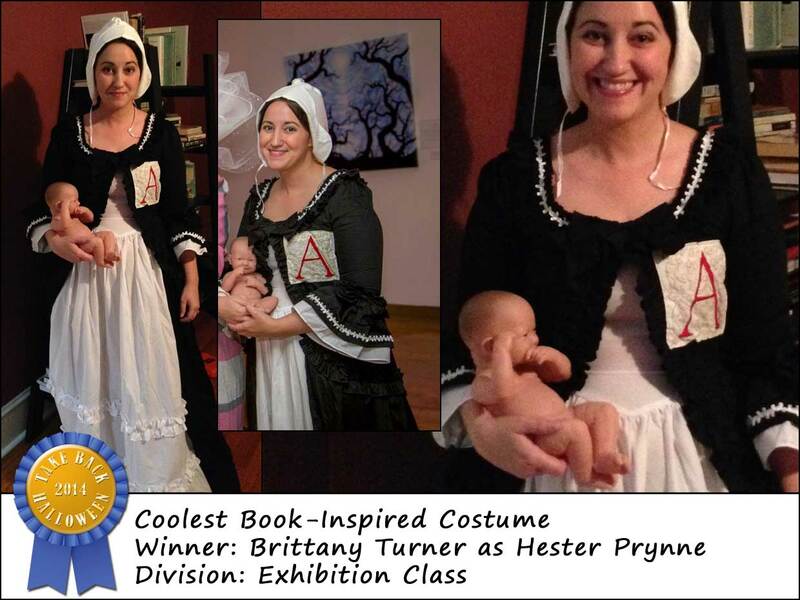 Winner: Brittany Turner as Hester Prynne. 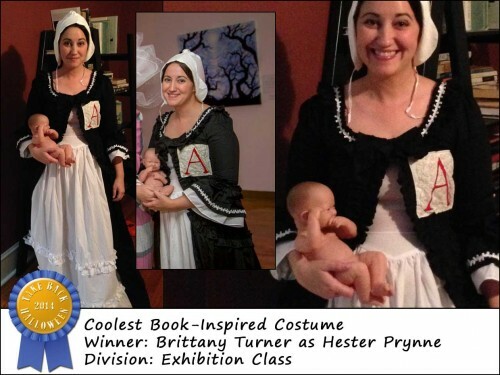 We love this costume, and Brittany hand-embroidered that lovely scarlet letter all by herself. The unswaddled baby somehow makes it both hilarious and creepy. Congratulations, everyone! Until next year!! !